Four cocoons opened, and One-Leg had lived to see it happen. One-Leg found Honey sitting near the Craft Trees, a place her mother had often frequented. She still wore that sour look of betrayal that she�d had on when she�d swept out from the Mother Tree like a stormcloud with a mane fresh-cut as short as Tallow ever let hers grow. �Just go away! You have no idea what I�ve lost! What all those turns in that stinking cocoon cost me!� The blonde-haired elf turned away from him. One-Leg held in his hand two thin sticks, a failed arrowshaft split in half, each with a bored acorn where sharpened stone would go. One, dyed bright orange, still had the cap it had come with. The other, a raw green, was topped with a wrap of scrap silk. He�d carved in divot eyes and toned them with ash. With a twist of his fingers the puppets faced Fadestar. The raven-haired girl, sulking at the foot of the Father Tree, pretended not to notice. Small, pale fingers reached out beckoningly, and One-Leg knelt down to allow them purchase on their goal. One-Leg held a low branch with his free hand to carry his weight, then rapped the end of his staff against the side of his wooden leg. �The missing weight had to go somewhere, lad.� If the boy were but a few years older, he might have made a different comment. The sun was low in the sky by the time One-Leg had another full load. How many times had he made this solemn journey, carrying home a collection of branches and driftwood, the final pieces of a fallen elf�s Final Howl? The shaggy-faced elf had lost count. Already there were questions, rumors, about what had happened with Fletcher. But One-Leg had not been the only elf in the Gathering Den the previous night who�d lived to see Owl work a healer�s magic, and to see him fail. Not even Owl could have kept Fletcher in his body if he�d decided to leave it, not even when that troll-fathered snot-miner was crazy and cruel enough to force his whims upon his fellows. There was nothing Willow could have done, and nothing more that could have been asked of her. One-Leg was at peace with Fletcher�s death, and he wished his friend well on the journey. The moment those words left his lips, it struck One-Leg that if that had been the truth of things, Axehand would never have known Fletcher. The archer was born well after Axehand�s fateful accident, and Axehand would have woken up to tales of an elf he had never met. 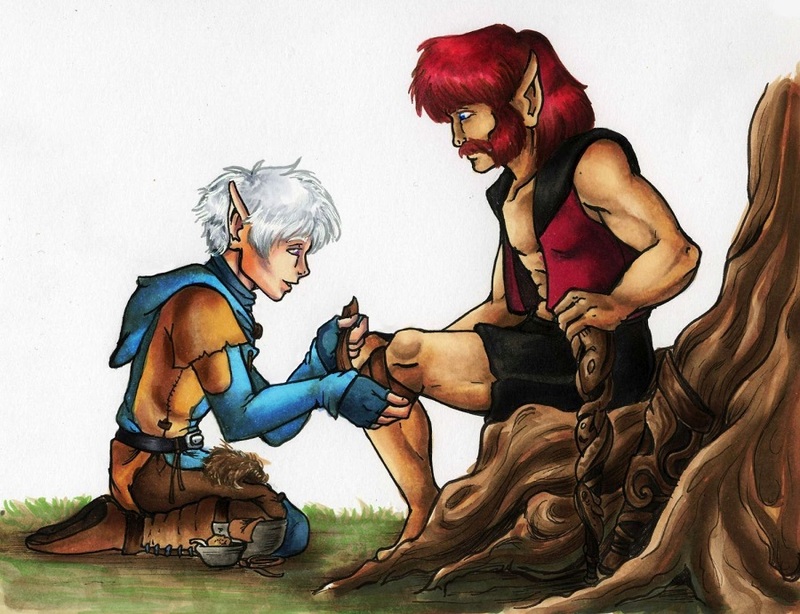 Fletcher would be unwrapped after, for his was a greater wound, but the younger elf would end up just as dead. And come the final Howl for one of his beloved daughter�s mates, Axehand�s furless mouth would have nothing at all to say. A light squeeze from his knees asked his wolf-friend to slow down so he could think. Many were the times One-Leg had spent soaked in wine and good company, counting the names of the elves that had come and gone while the sleepers waited. But he had never before sought the names of those he himself might never have known. And for the life of him, Fletcher�s was the one and only name on that list. If that wasn�t good news, One-Leg didn�t know what was. But once started, his mind kept searching, and it found a realization that chilled him and emboldened him all at once. Had Axehand gone into that silken slumber, Notch � his very own flesh and blood!-- would never have been born. And maybe, just maybe, neither would Otter. Honey and Fadestar, who would surely have been released before him, would be strangers to his eyes and nose and ears. As would their rescuer, Willow. So too Greenweave and Evervale, Whispersilk and Nightstorm. Crackle and Rill. Windsong. Beetle. Quick Fang. Foxtail! Dreamflight! Pathmark! Longshot! Goldspice!! Chicory!! Rainpace!! Their names and faces flooded into his to mind, and filled his heart, in no particular order, asking nothing more but that he know them. And know and love them One-Leg did! He had hunted with some, fished with others, rolled in the furs with many, lifted all upon his broad shoulders for a higher look at the world they�d been born into. He�d wagered and joked and feasted with them. He�d helped them through their trials, and they his. No strangers by far, they were his kin and friends one and all! Of what value was a rotten bit of meat worth compared to all that?